SCAPE employed computer-aided modeling and custom millwork to reinvigorate an apartment in an Art Deco building in Rome, Italy. SCAPE's transformation of the two top floors of a freestanding house in Rome's Colle Oppio neighborhood is a project that, as is often the case working with the city's ancient fabric, involved complex factors. The 2,368-square-foot apartment was distributed over three levels with two main floors and a mezzanine, "the fruit of numerous interventions that had been carried out in a disorderly and incoherent manner over the last twenty years." The renovation required structural work as well, including the consolidation of the floor slabs and roofing. The goal of the renovation was a spatially coherent and unified that uses the home's existing assets (high ceiling, great views) to its best advantage. The first operation allowed the redistribution of the various living spaces, including the first floor living room which looks out onto Colle Oppio. On the first floor, the living room takes advantage of the building’s high ceilings and the best views of Colle Oppio. The sleeping quarters upstairs are more intimate spaces: two bedrooms with their respective bathrooms. Large 13-foot-high cupboards introduce a connecting element between these two areas of the apartment. SCAPE's first move was to integrate a minimalist casework in elm wood for the central stairwell uniting the disparate spaces. The streamlined elm stairwell connects three levels of living space, from the public living areas to the mezzanine, situated to take advantage of city vistas, and the uppermost private quarters. The streamlined bathroom space is clad in travertine, with elm wood cabinet drawers and a seamless wraparound countertop-bathtub. The exterior of the Art Deco-era building on ____ in Rome gives no hint as to the resin floors, enamel faceted ceiling, and minimalist wood millwork within. Elevation of the renovated Via Mecenate apartment by SCAPE; the project, completed in 2012, comprises 2,368 square feet spread across two floors and a mezzanine housed in an Art Deco building in Rome. For the renovation of a top-floor apartment on Via Mecenate in Rome, the architects at SCAPE took a transformative approach, stripping the space of its Art Deco details and inserting custom millwork and a minimalist wood stairwell volume. 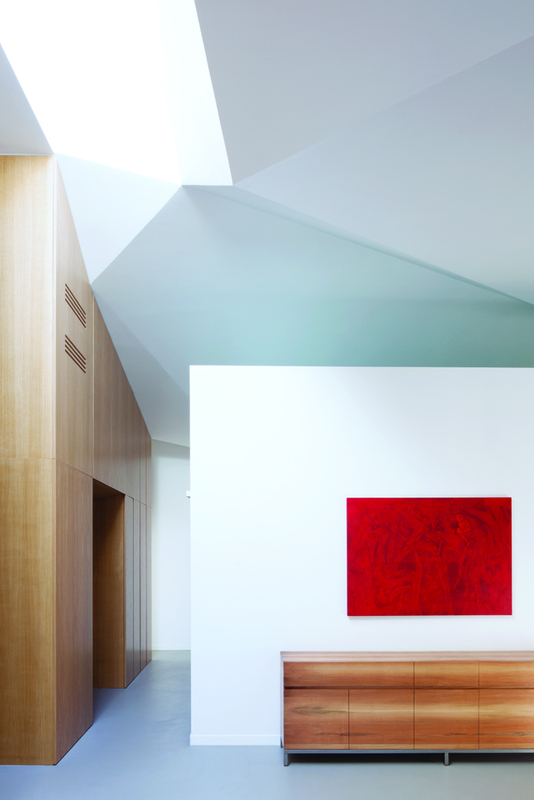 The most striking addition is a faceted enamel cathedral ceiling designed using building information modeling (BIM) technology. Materials throughout the 2,368-square-foot space are recognizable to any Italian architecture buff: travertine, elm wood, and brick and plaster for the exterior, which remains untouched.